Well one week tomorrow is my first show....am I ready, no not yet? will I be? I hope so... am I nervous, a little. Do I have enough stock? well that I can't answer. Questions I keep asking myself and hoping to find answers to but in the wake of it all, I do enjoy creating and sometimes I just can't stop. My kitchen table studio is plastered right now with paper supplies, painted things that are finished but need something added to them or something sewn on like the tops of my canvas stockings. The list seems to be growing and somehow I feel like nothing is getting accomplished. A little anxiety setting in but I guess it's a wait and see kind of deal. This year I had to do something a little different than what I had been doing, just painting away then dropping items off to an Open House and then at the end pick up what didn't sell. I did HomeSpun Hill for years but Evelyn decided to drop the vendors and just keep things in her store so I had to find other avenues. So back to the routine of sitting inside buildings and actually meeting and talking to people as they scan the booths etc. I don't do Ebay or Etsy I just do shows to give me a bit of money over Christmas and that is all I do. To do what I do takes many long hours and I would hate for it to become a job, I wouldn' t enjoy it as much either. I can't believe how the weeks are flying by, here it was Monday and I was thinking of all the things I wanted to get done and here it is Friday already, Monday is just a blur now. 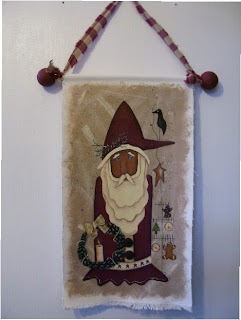 I did get some more things painted and I will quit my ramblings now so you can take a peek. 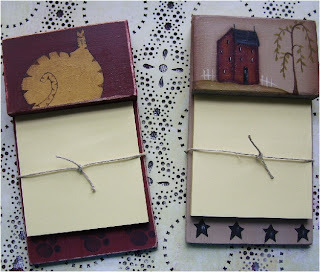 My next post I will be showing you my tea light cards that you can give as a hostess gift or something to someone as a special thank you or for someone that is hard to get something for. I have to finish those so here goes my painted items. 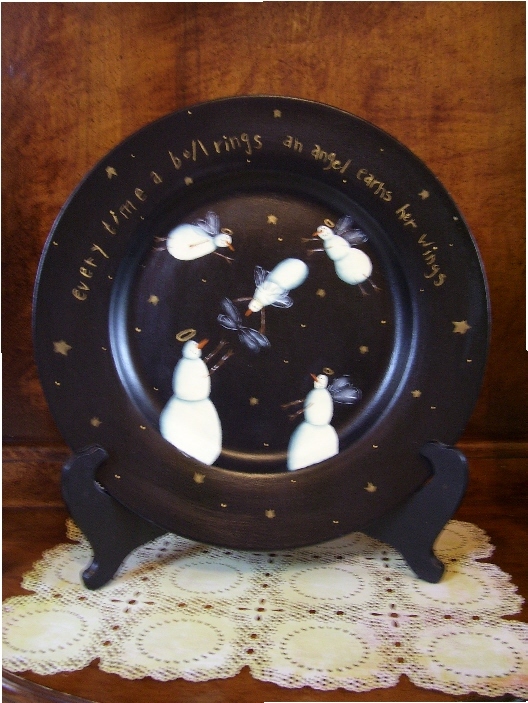 This is a dinner plate painted with this cute snowman angel pattern , the wings have a bit of glitter on them and sparkle when the light catches them. 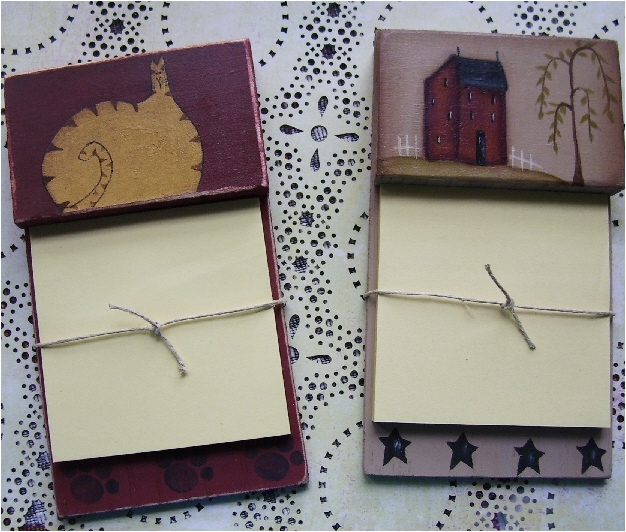 These are Post it Note holders I painted up. Hubs cut the pieces out for me and then I put them together and painted them. The bit of twine is just to keep it held together in transport. I think these would be great for teacher, bus drivers or anyone gifts. My fav is the little santa elf with the Wish List. 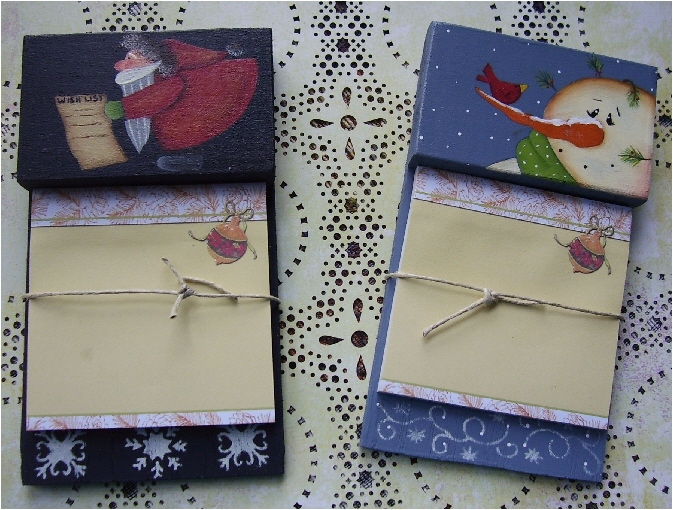 That is a Prudy Vanier pattern.How lucky to find some Christmas Post it notes at the Dollarama. I think they add a nice touch with the bit of colour on them, don't you? 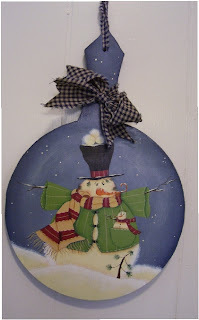 And below, I don't know if this is supposed to be a wood paddle or what but I took a dinner plate then drew the handle out and attached it to the circle on my transfer paper and cut the wood out and painted this cute snowman from Renee Mullins. I just had to paint it on something he is so darn cute and that face just makes you smile. So as you can see I am not wasting much time these days and nights. The workshop has been closing rather late these past few nights but things are winding down a bit. 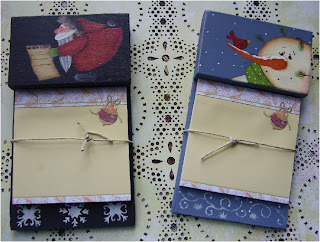 Stay tuned and I will be showing some paper goodies in my next post. Brrreeeaaattthhhh.... LOL For me shows are so much fun. The energy exchange is at the highest point for everyone. I did my first real art show in 1975 and still get that anxious feeling and the thought of... did I make enough, do enough..... But when the doors open all is well and the fun begins. You pieces are wonderful and I know you will do well. Wow! You've been really busy!!! Everything looks amazing as usual =) Keep up the great work Les! Great job, Les, I love the christmas post it note paper. We never have good stuff like that at our dollar stores. Looks perfect with your designs. Everything looks wonderful! Can't wait to hear how your show went!